As always, SNSD‘s performance for the first half of the year has been nothing short of impressive, but really that’s what you’d expect of SNSD. Firstly, let’s talk about what makes SNSD the formidable group that they are, or as netizens like to put it; “the wall others can’t climb over”. The table below shows the 15 top male artists and 15 top female artists so far in 2013 according to physical album sales. 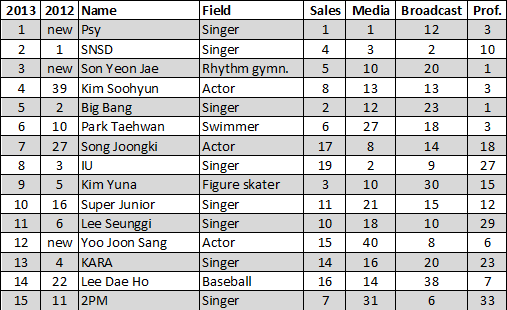 As you can see, the artists selling the most physical albums are idols; specifically male idol groups. In the predominantly digital South Korean music industry, people don’t really buy albums unless they are a big fan of the artist (collecting expensive albums is really just not economical). Basically to sell a lot of albums, you need a lot of fans. This is why idol groups dominate physical sales – because they are marketed specifically to create loyal fanbases that will buy their albums. 2013 Top 15 Male & Female Groups (Domestic, Physical) as of May 31, 2013. **Figures are rounded to the nearest hundred. Now look below at the top 30 digital aggregates – where the physical sales indicate ‘fandom size’, digital sales are more indicators of how popular the actual song is with the general public, and therefore how well known the artist is with the public. For instance, look at the relatively new groups VIXX and B1A4; although they did well in physical sales, they’re not on the digital list. This shows that they have sizeable support from idol-fans, but outside of those fandoms, the general public has little to no idea who they are. On the flipside, Huh Gak was unable to sell a lot physically, but he did well digitally; if you pulled a random Korean off the street they’re much more likely to be able to name a Huh Gak song than a VIXX or B1A4 song. Get it? By the way, definite shoutouts have to go to Taeyeon who is a digital beast all on her lonesome. Future solo career secured, much? *these figures do not represent downloads, but Digital Aggregates: a point system representing revenue brought in by all digital sources. So where does SNSD come into this equation? They are one of the only artists that have the ability to top both digital and physical sales lists. SNSD is the only girl group to be in posession of both a Digital Daesang and a Disk Daesang (these are like Korean grammys). This means that where many girl-groups get public attention but are unable to attract large amounts of dedicated fans like boy-groups do, SNSD has managed to create a fandom the rivals the biggest boy-group fandoms. And where many idol groups are able to attract fans but the general public doesn’t care about them, SNSD has managed to become a household name. The only other idol group that can boast that kind of fan-attention as well as public-attention is Big Bang, which is why SNSD and Big Bang are often considered the top two groups in Korea right now, in their own ‘top-tier’. SoShiBang wuh wuhhhh. Now, how have SNSD done so far this year? As you can see, physically they are selling extremely well – which is to be expected of a group with such a large fandom (no matter the song, fans are always gonna buy the album). Digitally though, I’m going to risk some hate and say that they could have done better. I’m not saying “I Got a Boy” flopped – it is quite impossible for an SNSD song to ‘flop’ at this point (I mean it’s still gotten over 100 million points), but for whatever reasons that I’m not going to comment on, “I Got a Boy” has had a smaller digital impact and less love from the public than SNSD’s previous releases. To put things in perspective, IGAB sold about 300,000 digital albums in it’s first week of release. In 2011, “The Boys” hit about 750,000 in it’s first week. Last year, even sub-unit TaeTiSeo had a first week run of about 600,000 with “Twinkle“. Conclusively, for all it’s hype, although IGAB in no way did badly, you could say it did badly for an SNSD song. If it had been any other group but SNSD it probably wouldn’t have done as well as it did. However, if you look GAON‘s (it’s like a korean BillBoard) 2010-2012 graph of SNSD’s charting history (let’s exclude Mr.Taxi because that was an obvious lazy mis-step on SM’s part), SNSD generally have an up-down-up-down pattern with their releases. “Twinkle” finished 2012 as the 11th highest ranking album of the year. IGAB is most likely not going to going to make it into 2013’s top 10, but I guess we can have high hopes for whatever SNSD’s second korean release is later in the year or early next (hopefully…). Tiffany has dropped hints on upcoming SNSD albums and a TaeTiSeo comeback, so that should be taken into account too (then again maybe mushroom is just lost). Meanwhile, away from the Asian mainland we have Shoujo Jidai chillin’ over in Japan. The first half of 2013 has been a real money-spinner for SJJD. If you remember, SNSD’s 1st Japan Arena Tour generated over 20 billion won (~19.mil USD) in it’s 14 shows. 2013’s Girls&Peace Tour finished up at 20 shows, so logically you’d expect an even higher revenue. Girls&Peace was released in 2012, but it was released pretty late in the year so I’ll include it here just so that you can get a gist of where Shoujo Jidai stands in Japan right now. Above are the deets on how Girls&Peace faired in 2012, (they’ve since obtained a RIAJ Platinum Certification, meaning they’ve shipped over 250,000 copies). Now, a lot of the hype around ‘hallyu’ in Japan has died down somewhat if you compare the insane media coverage SNSD got during their Japanese debut in 2010 to media coverage now. Plus relations between Koreans and Japanese have been more strained in the last year or so. SM/Universal Music Japan can no longer use use the novelty of hallyu to get attention with SNSD, so their focus has shifted to maintaining the Japanese fanbase rather than gaining new fans. Above is a list of the top K-pop acts in Japan for the year 2012. As you see, SNSD tops it with Kara right on their heels (Kara and SNSD are pretty much of equal standing in Japan). Don’t confuse this as SNSD being a top group in Japan though; they have a strong standing there but they’d be considered an middle-second-tier group if anything, as there’s still no way though could beat representative Japan groups like AKB48 or Arashi. 2011 was a pretty fantastic year for them; they finished the year as the No.5 Best Selling Artist with the No.5 Best Selling Album of the year with Girls Generation, The First Japan Album. 2012 was not quite so fruitful – Girls&Peace finished the year at No.42. Girls’ Generation was in fact, so much more succesful that it sold well throughout 2011 and 2012, and actually beat Girls&Peace on the 2012 yearly ranking at No.25. If you simply look at the difference in performance between the two albums, one might think that SNSD simply fell out of relevance in Japan. However, the continued popularity of Girls’ Generation, The First Japan Album shows that’s not true. There’s a lot of possible reasons as to why this is the case, but Girls&Peace just wasn’t as popular, although that doesn’t mean SNSD have lost popularity. In the second half of 2013, SME is likely to be heavily focused on sorta-rookies EXO, and there is also a rumoured f(x) comeback around the bend. I have no idea where any future SNSD promotions will fit into this equation (although they are likely to happen later this year), but I do hope SM lets Shoujo Jidai do some really strong promotions in Japan as well. They sitting pretty comfortably at the top of K-pop, but they’re not yet a top-tier group in J-pop, so there’s still rungs to be climbed. Onto the next section, let’s talk CFs. Endorsements are pretty much the best way to measure how much the public loves a celebrity/how good a celebrity’s image is. Obviously, companies are going to want models with positive images that are well known to represent them, and that bill fits SNSD like a glove. SNSD have been the most sought after models every year since their 2009 popularity explosion. Their asking price is high, but they can sell anything. Above is ze list showing the most popular CF models in Korea every year since 2009. This is a pretty good indication of their good reputation, as well as how much $$ they gots in their pockets. *I might have missed some but it’s around the 5-10 mark. **I should point out that YoonHyun both endorse SK Telecom, who have been completely spamming CFs. So it hasn’t been a massive half-year CF wise for SNSD, but in terms of CFs and endorsements the SNSD members have definitely been working independantly a lot more this year. Eg; Sooyoung for Double-M, Jessica for Banila Co./Stonehenge, Hyoyeon for TopShop, etc. The member that’s been the least active so far this year with endorsements/CFs is has been Sunny I believe….Get off your arse Soonkyu. Above is the top 15 celebrities of 2013 according to Forbes Korea. The first collumn shows their 2013 rank while the second shows their 2012 rank. SNSD have topped this list in both 2011 and 2012, and are still killing it even though Psy booted them off no.1 with “Gangnam Style”. SNSD in 2013 have been sitting snug and comfy in their ‘top celebrity’ status. Although the performance of their recent releases have been somewhat lacklustre for SNSD’s standards, it’s pretty obvious that their reputation and influence has taken no knocks and they definitely aren’t planning on vacating the top spot anytime soon. What to expect? SNSD are definitely going to rake in hefty loot of CFs before the year ends, and their second korean release for the year, if there is one, is going to be a definite daebak. If you stuck with the article to this point, hope it was informative! Outstanding article. Thank You. Great information. I wonder if it’ll be a Korean or Japanese album…..
One of the disadvantages of SM is they have so many popular groups now… They rotate promoting them so groups end up having to wait. Personally I want a Japan album again.like the writer said they have more they can still achieve there and I like snsd’s Japanese releases a lot. Awesome analysis article, proctie ;). Man, I bet nobody pre-2009 thought SNSD would come this far…. oh good reaf thx ! SNSD will be the first. Sunny it will be restored. Otherwise cannot be. based on gaon chart that you presented above, my opinion about why “Mr. Taxi” has gone drop to far rather than other song maybe because “Mr. Taxi” was introduced first in japan, and as japanese song, and that was the first time the girls try to enter japan music field, where they completely focus to gain listeners and fans so the promotion is wonderfully huge, different when “Mr.Taxi” enter korea as translation into korean song, because they already has huge listeners and fans in korea, so they don’t do promotion in wholescale, as i remember “Mr. Taxi” firstly sung in korea when they do a concert, that’s so different when they do that in japan as first single..
so that chart is acceptable because that based on korean song and activity chart..
but if you attach sample of japanese song chart, you can compare it and prove that the girls are always on T.O.P. wherever they do their music..
that’s what i think about the Mr. Taxi on Gaon chart..
for album IGAB at the first half of this year, it has a lower rate than other maybe because the girls try to give us new style and vibe of music, as we know at many articles, the girls are confuse about IGAB song and style music, and the girls are knowing to that maybe IGAB song will be difficult (but not impossible) for the fans to listen and the excitement in this song, and for me the sales rate when the girls openly give us a really new whole music style are fabulous. If other group try to do that maybe the result not as good as what the girls done, so that still fantastic right? and about the new korean album, i really excited waiting for that..
and guys that absolutely great data..
salute for your effort to this site to inform us more about the girls..
Actually the reason Mr Taxi dropped is because its a quick repackage of The Boys Album. Only few bought it knowing that there are no new songs only the cover has change. I’m really concerned about their status in Japan. Recently release was really disappointed with low selling although L&G doing really well in iTunes Japan. and I don’t know the song do well or not in part of Digital sell in Japan(Ringtone, Mobile download,etc) with not much promotion compered to previous singles. there is a huge lack of japanese promotion for soshi. i was a bit disappointed too, but now i think it’s quiet okay with this disastrous promotion. UMJ and SM should really start thinking about some events and shows for girls. in japan they use to make their local artist “golden boy”..
because they must and still keep their local artist become 1st before another..
so a comer like SNSD must think many way to promote in their own way.. I like objective analyses like this one. It gives us a clearer picture of where SNSD is at the moment. Congratulations and thank you for such an informative article. Is there any chart from digital sales in Japan? I ever read, it call soundscan or something. You already include physical and digital from Korean, and only physical (Oricon) from Japan. Also, I think you also must include what artist int the first place, their total sales and how many singles/ album they release and compared with SNSD data. I just tired with comments that they like number one in the world. Yes, they are number one in Korea but not really in any other countries especially Japan as their second countries for promote themselves. Beside that, thanks for the article. In this digital era, I think digital sale more represent the general popularity. Idol group rely on physical sales because anything what the group release, fans will be buy it despite you like the song or not. for digital sales, you won’t buy song if you don’t like it. 2013 has been Suzy’s big year. You can be sure she’ll be ranking high on the 2013 CF list. She might even top it. hi, i have a request : can you email address or home or residence of one of the girls generation members i canfind . an jvabtvn’ll send a mail . grateful..
“IGAB is most likely not going to going to make it into 2013′s top 10, but I guess we can have high hopes for whatever SNSD’s second korean release is later in the year or early next ” it’s not that it didn’t do well for an SNSD song, it has a pretty good sales for an album actually, it’s #2 for overall album sales, to think, it doesn’t have a repackaged album yet. And consider the price, it’s actually more expensive than their previous release. And some fans haven’t bought the album yet, they’re actually waiting for the repack. Sorry I should have clarified. It did well physically of course but that’s to be expected. I was talking about the GAON’s single chart which looks at online chart performance and listener preference more than physical sales. I’ve never known SM to be so slow with a repack but I’m really keeping my fingers crossed for it too. Umm, may I know where you got all those data? Good job, in depth information keep it up. That is a thorough analysis. Thanks. BTW, shouldn’t you or did you include information about Sooyoung starring in Cyrano Dating Agency drama and (although this for later release) about Yuri starring in the movie “No Breathing”? I suppose you didn’t bother to include SNSD going to concerts and other events in Korea and abroad. Well with dramas the members are making income independent of the group, and it’s hard to gauge how much each drama pays per episode. None of the girls’ dramas have been super popular spectacular success’ so in terms of SNSD’s performance as a whole, they’re negligible. I want I see my dream realy , and you are the only ones you can achieve that . I am if I can do something to done . sone good luck ! It’s impeartive an English album, we all know how big they are in Asia, they have the power to become an international act rather than just a “local” one, SM is sleeping and the train of worldwide stardom is leaving, for some reason it seems to me that Kpop is fading globally, PSY is only an overnight sensation, probably very well know there, but to the rest of the world is just another one hit wonder, in SNSD case they have endured for almost 6 years now and loved all across the planet, so please, let others enjoy the magic of GG.They can be legends, they deserve it. I am so happy, slightly relief. SNSD Hwaiting! their recent songs has not been that good (i.e. the boys, mr.tax, igab,.. etc). SM has to do better job. also, they should not concentrate on getting the American market. The more they try to create songs and images for the American market, the more likely they will fail. Gangnam Style was a catchy, fun song that was not purposely meant to “conquer” the US market, yet because of it’s novelty to rest of world outside Korea, it became such a hit. Another reason for Gangnam’s success the pervasiveness of youtube and other video services into the popular culture around the world in recent times. hope there is a song like “Gee”, “Hoot”, and “Genie” again..
with catchy and beautiful dance routine..
Nice. This isn’t boring for me at all. It’s very informative. Thank you for this information. 🙂 Good to know SNSD is really topping it! Thanks for this, solid research, I really enjoyed it. Appreciate a lot about the info provided here. I have been taking attention for SNSD 2013’s performance since as a devoted sone, I do realise they have less constant or big branded CF in 2013. Not to mention, our forever It girl, Yoona is losing some attention due to the explosive popularity of National First Love. Hope they will do better after the 2nd release in 2nd half of 2013. And SoonKyu ah!! You are so much prettier with the recent hair style.. Grow it and spread your aegyo again<3 I hope I can see Soonkyu's individual CF!!! To include a report on SNSD with only a 1 – 2 lines about their HUGELY SUCCESSFUL concerts tours (2nd Japanese Arena Tour and their current World Tour) is not very knowledgable about the music business. Regarding your CF count does include SNSD’s overseas CF endorsements like ‘True Beyond’ in Thailand because you mentioned the Top Shop CF for Hyoyeon ??? Also for your digital rankings, you dont mention that GAON added the Genie service (you should be familar with Genie since SM puts Genie ads in all their MV’s they upload on Youtube) starting in April. So releases starting after April 2013 will do better in terms of digitally than those releases before April 2013. FYI : BuskerBusker had higher digital sales/rankings than Bigbang in 2012. Thanks for the time to put in some input! Yes concerts are important, but the focus of this article is about SNSD’s status and their position within the korean industry and public eye, not their revenue. Therefore activities that are only participated in by fans (ie concerts) I didn’t feel the need to include. For the same reasons I didn’t include SNSD’s overseas endorsements; the mention of SNSD’s solo endorsements were only mentioned briefly just to indicate that the girls still have pull as models even though their CF work has been lagging. For you info on Genie, thanks! I didn’t know that. thx for all the info. really enjoy reading all the thing you wrote. Reblogged this on HeyImSuperGirl . like for each single, album, dvd for each group! hey next year, snsd contract would be end right? i’m sure LSM would not letting go these 9 girls . so, is there any chance they renew their contract but they make a deal with LSM that they want to continue snsd if he let them choose the song and style they want?? lol… i mean i really hope their career could last as long as posible but i want them to continue their career with happy, free and proud feeling specially hyoyeon. is not that SM didn’t give them a good song. everytime GG release a song it always become a hit and spotlight. but i think the wheel start to spining down. and now SM start focuse more on exo and fx. Thank you for a very informative and interesting article. As a Sone, I’m always interested about how SNSD is doing in relation to the other artists.